We are recognized as the leading Exporters of Reconditioned Alfa Laval, Mitsubishi, Westfalia Oil Separator, Centrifuges and Purifiers. The capacity of oil separator offered by us is around 500 LPH to 20000 LPH. 3 phase liq-liq-solid separation of fuel oil like lubricating oils, furnace oil, biodiesel, transformer, hydraulic oils, Virgin coconut oil etc. Purification or Clarification of mineral oils used in marine installations, power stations and many other industrial applications. When you order a centrifuge or separator from us, you’ll receive extremely good value for money, first-class quality products and delivery even at short notice. 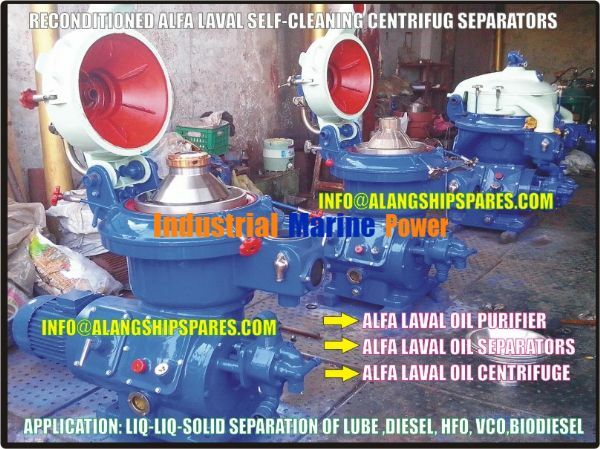 Refurbished Alfa Laval Self-Cleaning Marine and industrial centrifuge, oil purifier, oil separator. For Sale Self-Cleaning Alfa Laval MAPX-207 centrifuge separator MAPX-207 SGT-24-60 alfa laval self-cleaning with electric motor, feed pump, tools set and manual. VERTICAL DISC TYPE SEPARATORS. Capacity : 5000 to 7000LPH. Applications: Purification of lube oils, diesel , Biodiesel, furnace oil (HFO), Engine oil, waste, Virgin Coconut oil etc. 7- Maneuvering water system spring. If you need more specifications to do the budget, please, let me know. Looking foward for your anwer. 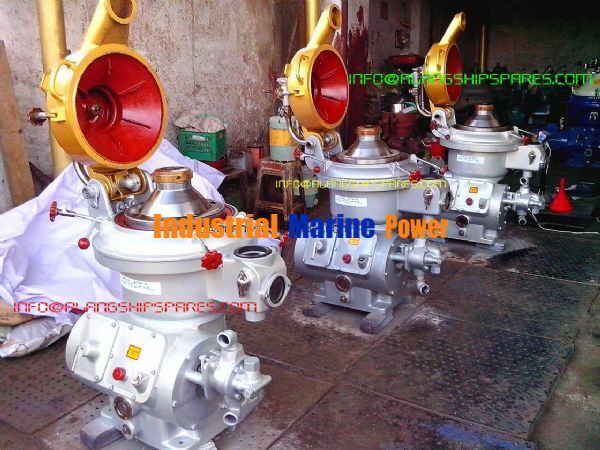 We want to inform you that we are one of the leading marine "OIL PURIFIER and Fresh Water Generator" stockist and exporter. 01. Type: JWP - 26 - C80. Y.O.B. 2001. 02. Type: JWP - 26 - C80. Y.O.B. 2005. 03. Type: JWP - 26 - C80. Y.O.B. 1996. 04. Type: JWP - 26 - C80B. Y.O.B. 1997. 05. Type: JWP - 26 - C100. Y.O.B. 2001. 06. Type: JWP - 26 - C100. Y.O.B. 2005. 07. Type: JWP - 26 - C100. Y.O.B. 2006. 08. Type: JWP - 26 - C100. Y.O.B. 2006. 09. Type: JWSP - 26 - C100. Y.O.B. 2007. We will have your valuable inquiry time to time according to our above enclosed stock. Looking forward to received your valuable inquiry.